My mom has been making these breadsticks since before I can remember. They were always a favorite among my family (five siblings and parents). We thoroughly enjoyed them with her best lasagna recipe or spaghetti, or anything really. I remember helping make these many times as a little girl. If you have kids, it’s a great recipe to use to teach kids to cook. All it takes is rolling, dipping, twisting, and sprinkling—so easy. 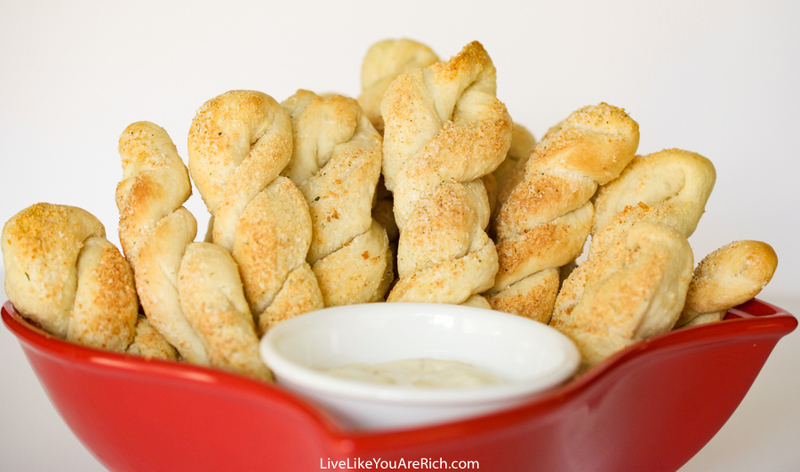 Further, they are inexpensive to make (I can make about 60 breadsticks for under $7.00). Dipping them in a thick ranch dressing dipping sauce (esp. Litehouse Ranch Dipping sauce) makes them the best. 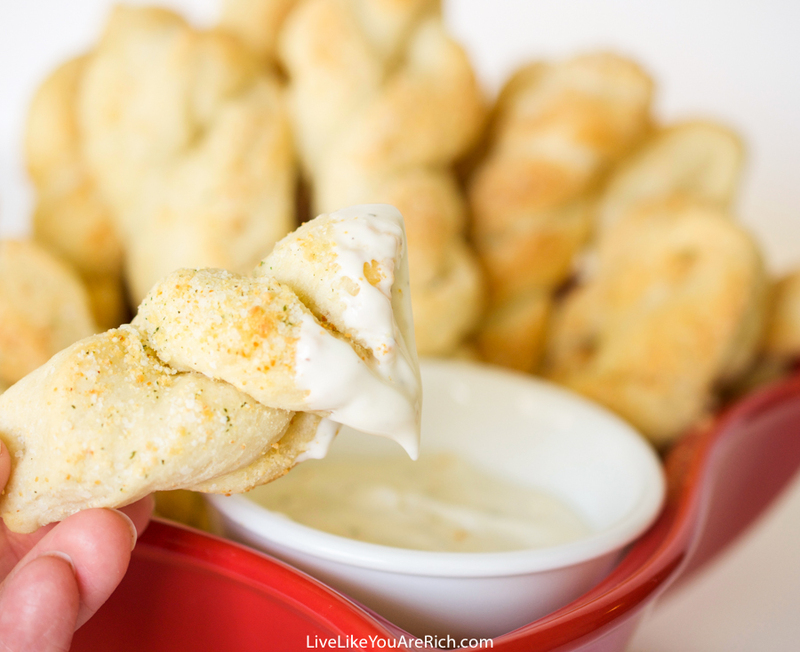 I like these breadsticks even better than Olive Garden’s—yes they are truly that good! Give them a try, and leave a review below. Take 2 or 3 loafs of frozen bread dough out of the freezer. Place on counter top for a few hours until defrosted and slightly risen. I used Rhode’s Frozen Bread Dough. Preheat oven to 350 F. Cut each bread dough into 12 pieces. Roll them lengthwise so they are about 8 inches or longer. 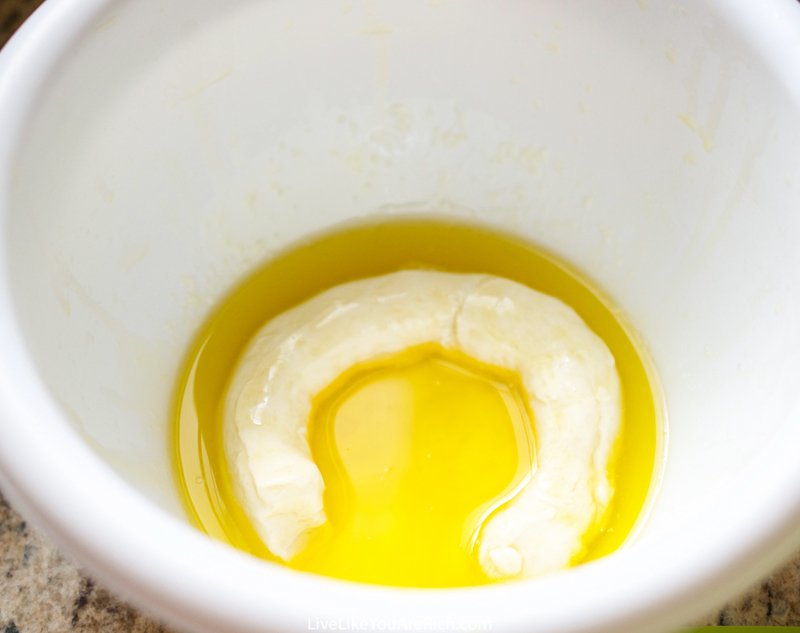 Dip the rolled out dough into salted butter. Then fold in half and wrap the dough around each other creating a twist and pinch ends. Lay them on a tin foiled or silicone baking mat on a heavy duty sheet pan. They may unravel just a bit that’s completely normal though. Sprinkle 1/8 teaspoon Lawry’s garlic salt per stick. Then cover generously with parmesan cheese. Cover with sprayed plastic wrap and let rise until about double in size. I usually don’t wait more than 30 minutes. Bake for 15-20 minutes or until the parmesan is golden brown. 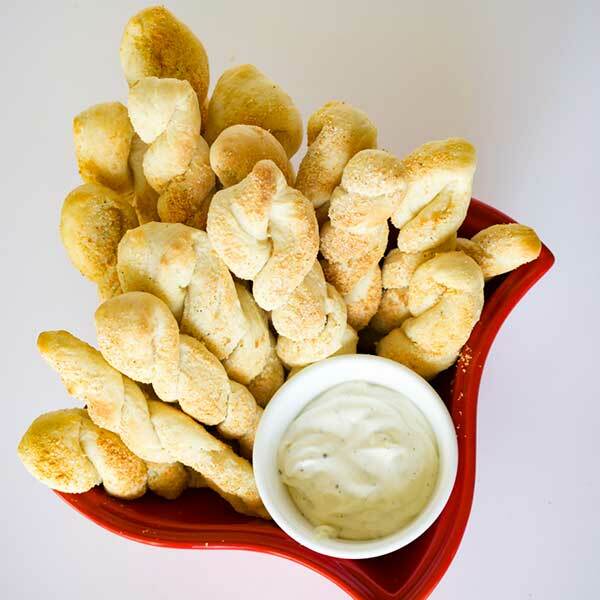 Serve warm with ranch dipping sauce, marinara or plain. 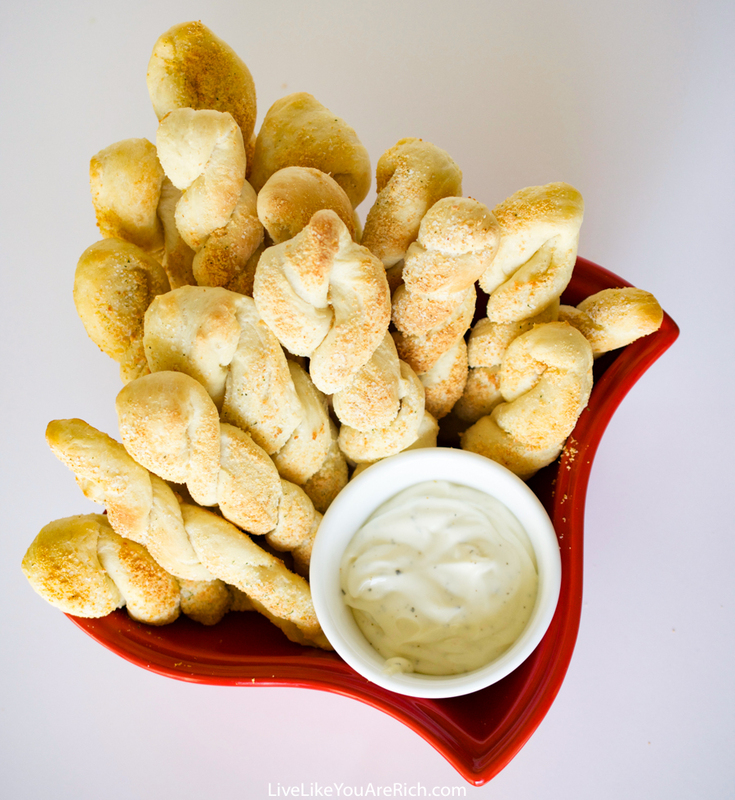 Making breadsticks out of frozen bread dough is a very simple and quick way to make a meal more gourmet. Give them a try and let me know what you think. Take 2 or 3 loafs of Rhode's frozen bread dough out of the freezer. Place on counter top for a few hours until defrosted and slightly risen. Preheat oven to 350 F Cut each bread dough into 12 pieces. Roll them length wise so they are about 8 inches or longer. Dip the rolled out dough into salted butter. 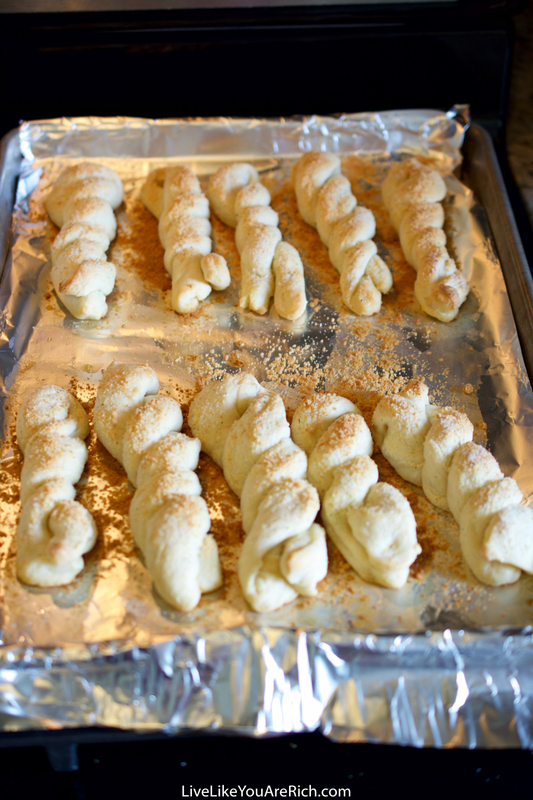 Then fold in half and wrap the dough around each other creating a twist and pinch ends. 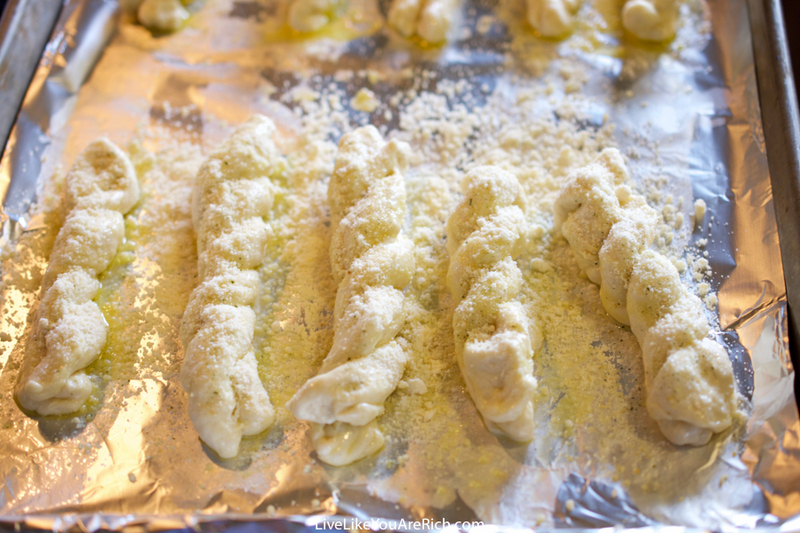 Lay them on a tin foiled or silicone baking mat on a baking sheet. They may unravel just a bit that's completely normal though. Sprinkle ⅛ teaspoon Lawry's garlic salt per stick. Then cover generously with parmesan cheese. Cover with sprayed plastic wrap and let rise until about double in size. I usually don't wait more than 30 minutes. Bake for 15-20 minutes or until the parmesan is golden brown. For other ‘rich living tips’ please subscribe, like me on Facebook, follow me on Pinterest and Instagram. SO easy!!! And I love the twists! 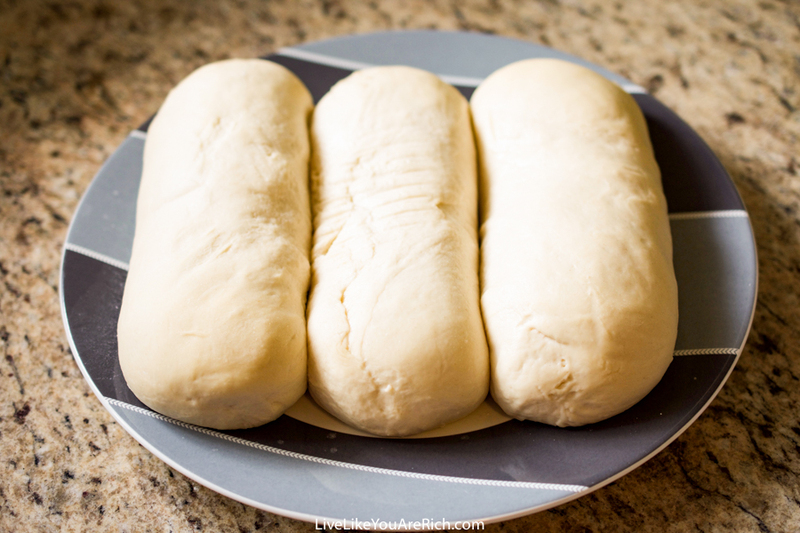 I have made lots of stuff our of frozen bread dough, it’s simple and always tastes great! It’s also a cheap way to make sticky buns and other sweet bread treats. That’s such a great idea to make sticky buns and sweet bread treats with frozen bread dough! Thanks! 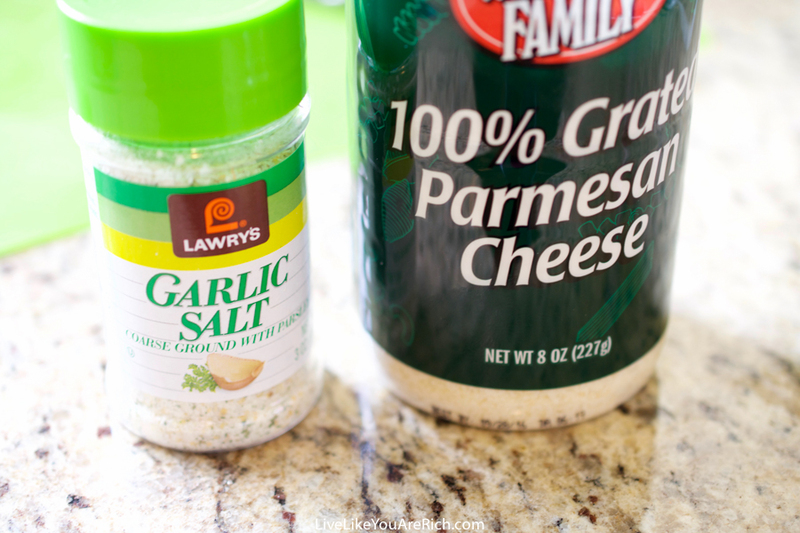 I freaking love Lawry’s garlic salt. Like so much. More people need to use it as an ingredient in recipes. Yes it is so so good! Thanks for stopping by!